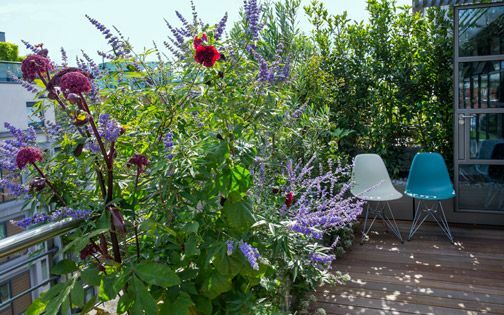 This intimate rooftop terrace provides a textural haven to soften and enhance its urban river backdrop, where Mediterranean flora thrives amid blustery wind, producing a low outline to preserve an expansive London skyline. 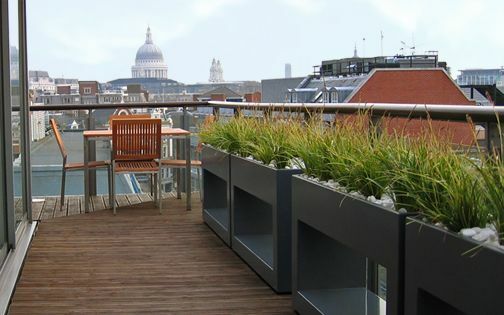 With St Paul's Cathedral and Tate Modern forming a central sightline, this small rooftop terrace's unparalleled landmark spectacle defines contrastive breadth, within a 360-degree panorama. 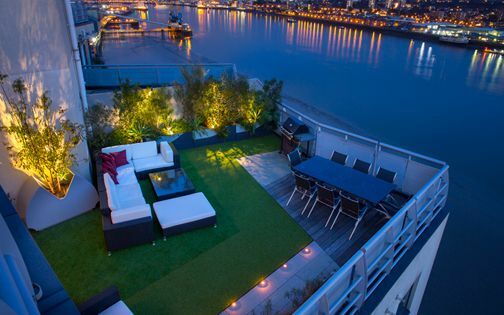 The penthouse apartments atop Sir John Lyon House in High Timber Street offer exceptional views, at this expansive vantage point above River Thames. 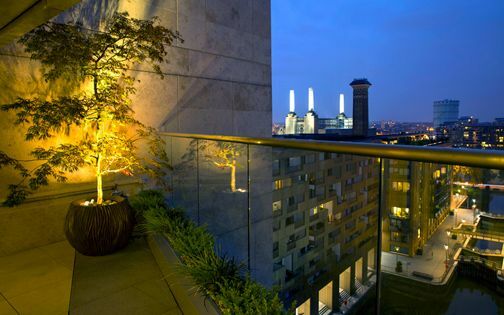 Developed by local London designers RM Architects, the building's low-rise layout was integrated sensitively into its cityscape, inline with St Paul's Heights Policy Area regulations. The small rooftop presents an intimate, chic terrace, amid spectacular landmark vistas, perched above the living room's blueprint. 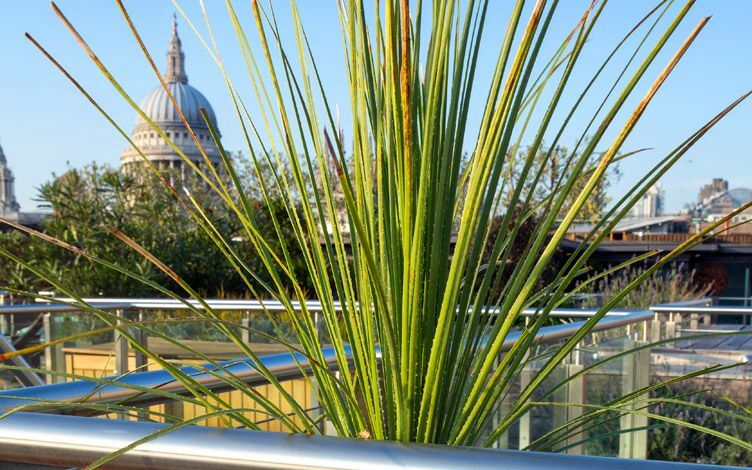 Aligned perfectly between St Paul's Cathedral and Tate Modern, this roof terrace's prominent location beside Millennium Bridge produces a definitive historical perspective, forming an ultimate backdrop for a terrace design & build which merges architectural minimalism with diverse foliage. 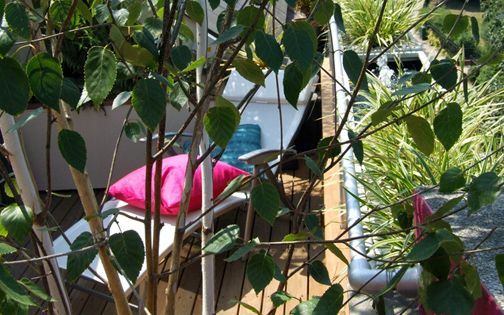 The rooftop lounge is surfaced with an Ipe hardwood deck, enveloped by a stainless steel and glass balustrade, while the entrance pod area is utilised for further planting. 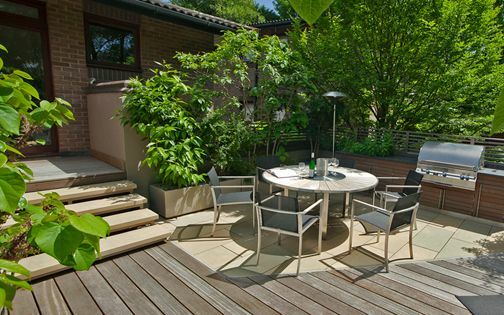 Site conditions are fairly polluted and often breezy, yet the south-facing terrace soaks up plenty of summer sunshine. 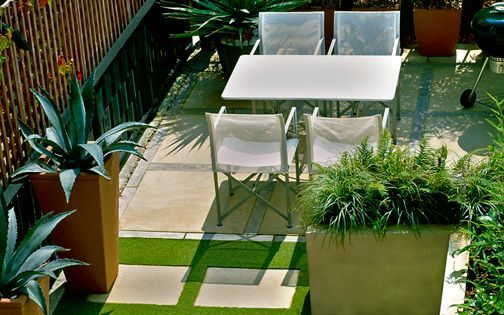 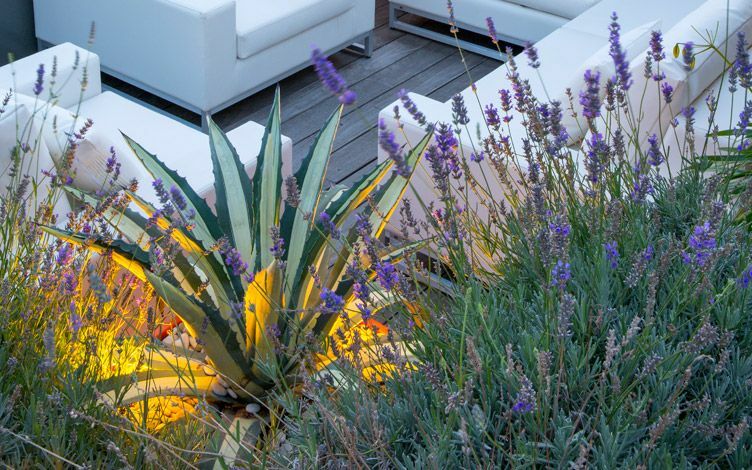 As our clients spend time between London and the Algarve, we planted a Mediterranean rooftop brimming with texture and scent to balance a minimalist garden design layout. We integrated diverse flora which thrives in a London river terrace microclimate, forming an invigorating retreat – reminiscent of the clients' Portuguese residence. 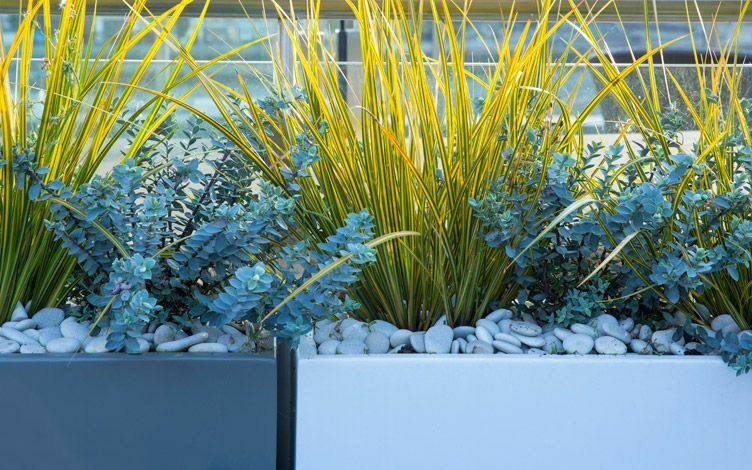 The minimalist custom planters glisten amid surrounding bridges and art galleries, contrasted by a highly textured foliage profusion. 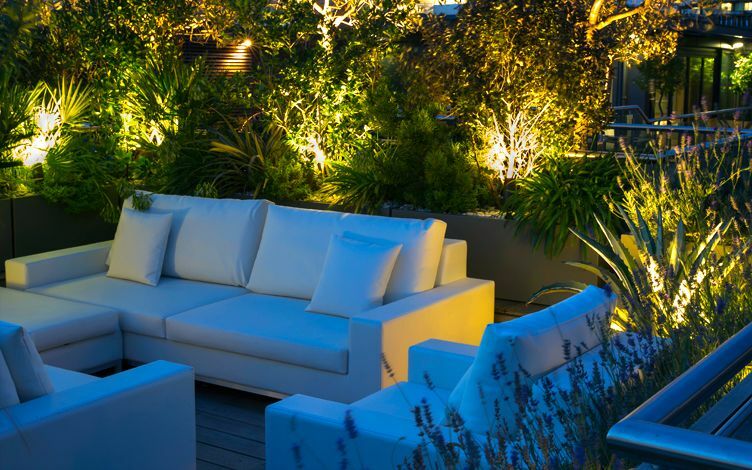 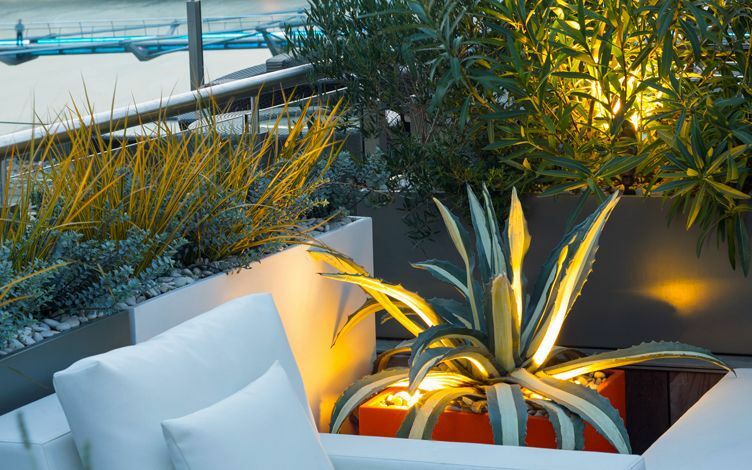 we took a streamlined approach in our bespoke planters design to contrast dainty, multilayered vegetation, augmented by weatherproof minimalist Manutti white sofas which further articulate architectural linearity, enhancing elegance and context. 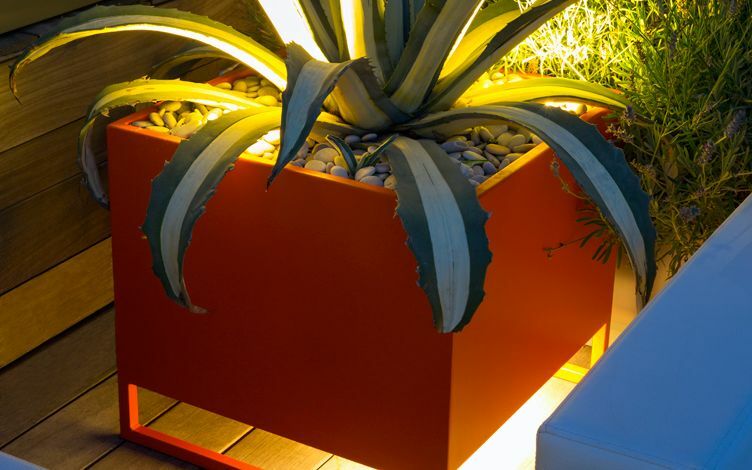 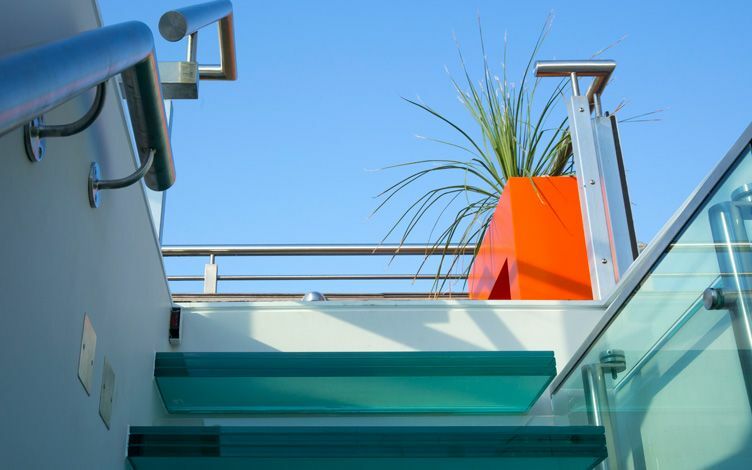 The orange square planters echo the building's cladding colour, generating vibrant energy with an LED lighting design. 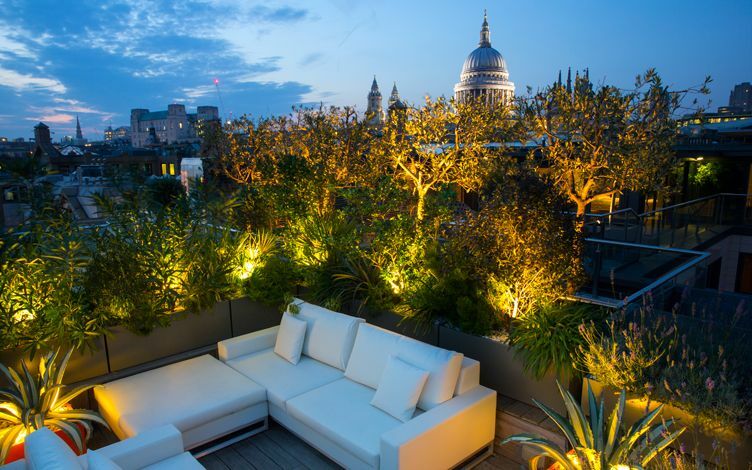 The expansive vistas towards countless landmarks outline Shakespeare's Globe, Tate Modern, Millennium Bridge, London Eye and the Shard, with majestic St Paul's Cathedral forming a central backdrop. 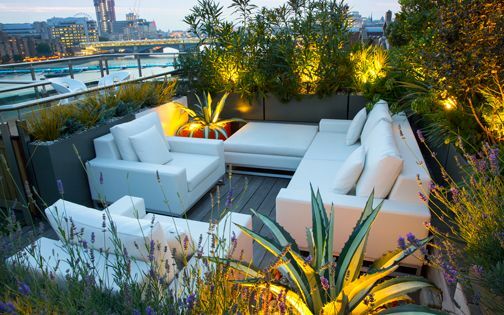 Floras from Australia, the Mediterranean and South Africa define ideal selections for this rooftop design, infusing diversity which represents the eclectic nature of a London city terrace. 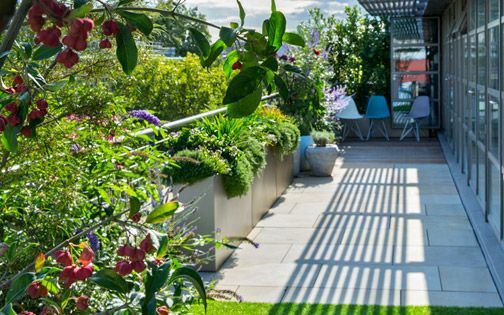 A tier of Olive trees defines the view to St Paul's, juxtaposed with Lavenders and Pines, while slim fitted troughs are displayed in pairs of white and slate-grey to accentuate the lounge sofas and conserve precious social space. 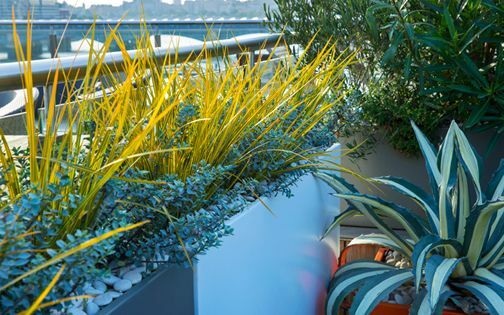 Agave, Sotol and Palm tree species narrate an architectural design, where sculptural Agapanthus adds height and blue petals, interspersed throughout the rooftop's landscape. 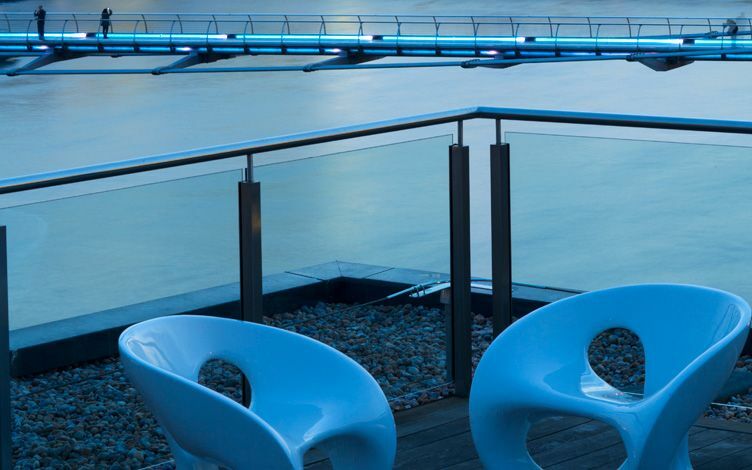 With a myriad of immersive vantage points, our roof terrace design retains uninterrupted views to a multitude of London panoramas, as in many rooftop design projects we develop locally. 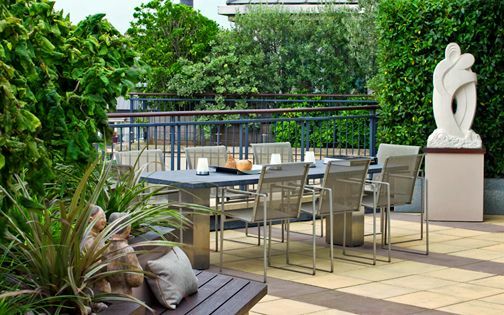 The bustling river scene and eclectic ambience imbue the terrace in urban nuances, enhanced by minimalist detail design, and layered with exuberant, invigorating textures to instil a sense of place and greater outdoor space.